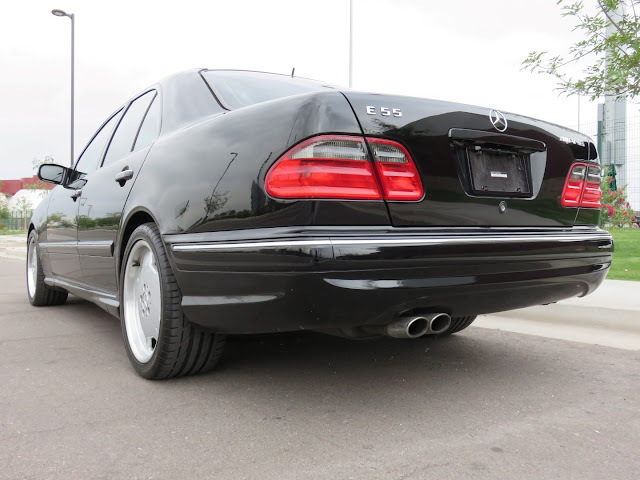 Check out this 2002 Mercedes-Benz E55 AMG here on eBay bidding for $8,100 with auction ending Friday at 4:25PM Pacific. One of the Cleanest on the Market! Canyon State Classics brings to market a super low mileage 2002 Mercedes Benz E55 AMG. This car has always been serviced and garage kept. This car's condition inside and out is excellent for the miles. The primary owners seldom drove the car but on weekends. This is one of the last true, low mileage examples of this first gen E55. Don't miss out on your chance to own this immaculate AMG car for a fraction of the purchase price! The car is finished in beautiful Schwartz Black and is gorgeous and was just fully buffed and hand waxed. The body on the car is laser straight, and does not have even a single door ding. Paint is all in excellent shape and is original other than a few expected paint chips which have been touched up. This Benz has always been garage kept and pampered its entire life and really shows. The car is equipped with the AMG option group which includes a beautiful interior, AMG emblems, exhaust tips, body kit, and specially designed staggered AMG alloy wheels. Another distinguishing feature is the carbon fiber door pillars. The AMG cars also got the newer style ?Avantgarde? color matched grille. The car is riding on 18" AMG Monoblock alloy wheels, specifically designed for the E55. They are wrapped in Almost New Michelin Performance radials. All 4 wheels just had the lips re-machined and are perfect with no damage. They were all spin checked and have no bends or issues. 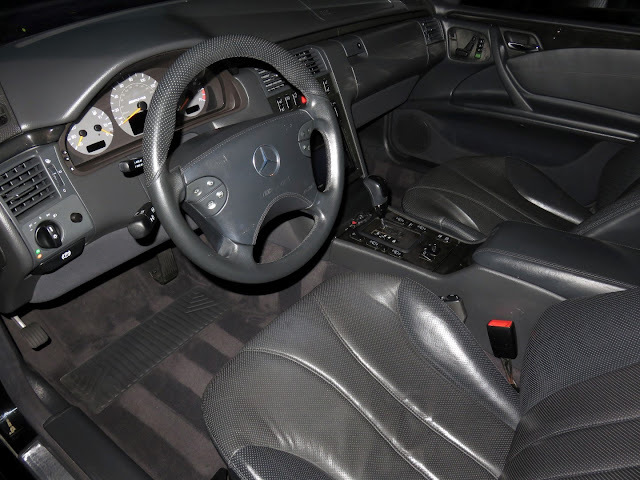 The beautiful black leather interior and is all original and looks like new. The car has original MB floor mats, complete set of tools, jack, and 2 keys. Everything works in the car.. lights, gauges, radio, seats, windows, locks, a/c blows ice cold, etc. The car will also include all of its original books, quick reference guides, and service history. It also has the original full size spare and tire. 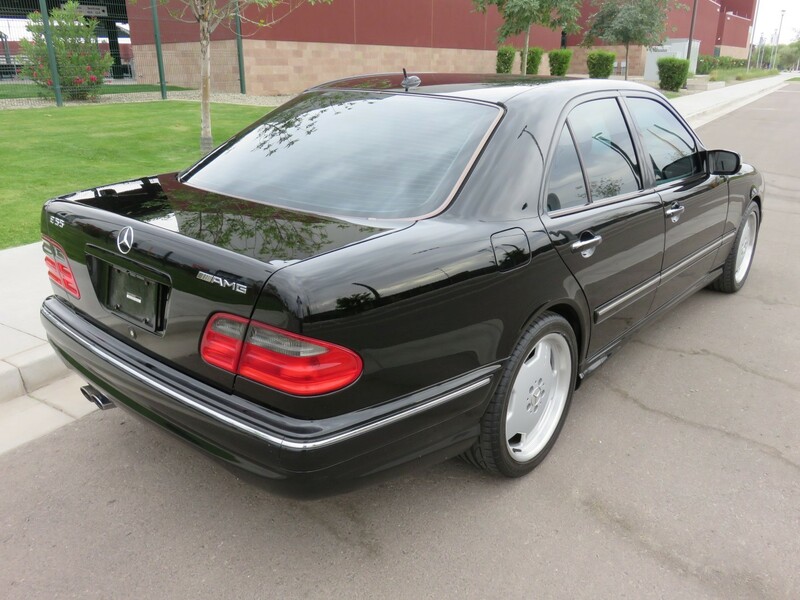 Mechanically, this Benz is in perfect condition and runs and drives great. It has very healthy and very quick and powerful 5.4l V8. These AMG engines are hand built by a single engine builder to ensure the highest quality. The car has a very strong automatic transmission that shifts perfect. The motor puts out 350hp and 391ft lbs of torque and is plenty to move this nimble E Class around. The car has just been serviced at an Mercedes Benz Certified shop and transmission flush, brakes, motor mounts, and plugs where done. This car is very clean under the hood and really shows how its previous owner took excellent care of it. The previous owner of this car was very meticulous about maintenance. We had the car looked over and just completed new front pads and rotors, new valve cover gaskets, and did a fresh oil service. We only pass on the best to our customers. This car is ready to go! The car is in excellent condition inside and out. The exterior of this AMG is stunning in Black with Black interior and is definitely the most desired color combination for the E55 Mercedes. 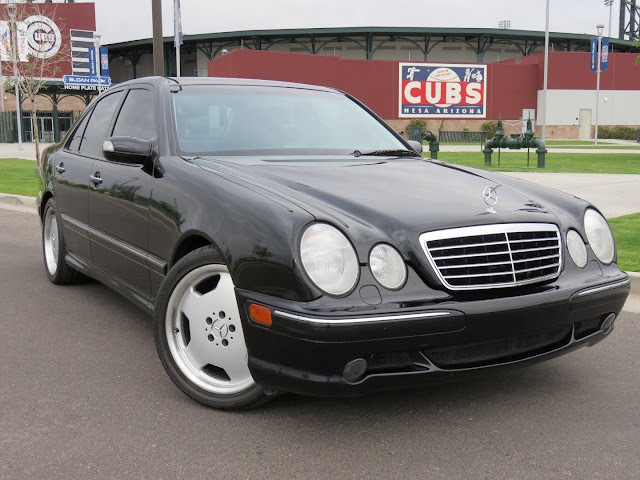 This is a super rare E55 and will make an excellent driver or collector?s item, and with these super low miles..you can?t go wrong! This car is also CARFAX certified! If you have any additional questions please call Jon at 480-703-2337. The car is located in beautiful sunny Scottsdale, AZ. Please email or call with any questions and I welcome international bidders! I can also help with shipping quotes and arrangements.